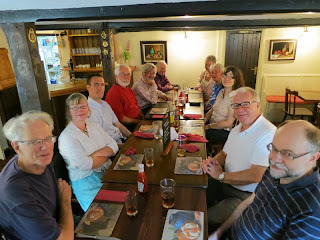 On Saturday 17th August 2013 the Stretham St James ringers had their first outing. As the band is quite small, the invitation was extended to others who, although not officially members of the band, have come along to practices at Stretham, some of them on a regular basis. The tour was organised by Tower Captain, Peter Binns, and took place in Hertfordshire where Peter had been a regular ringer before moving to Cambridgeshire. Five towers were visited during the day, with an hour for ringing at each, and plenty of time allowed for getting to the next tower. 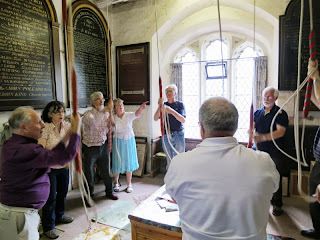 There were a dozen ringers on the tour (although one was unable to stay for the whole day) and as a result of the careful planning, all ringers had plenty of opportunity to ring at each tower. Of course no tower tour would be complete without a pub visit; in this case an excellent lunch was provided at the Moon and Stars in Rushden. The towers visited were Sandon, Wallington, Walkern, Benington and Weston. To round off an excellent day, the party retired to the Cricketers pub at Weston where it was agreed by all that the tour had been a great success and that another tour should take place in the not too distant future. A big thanks to all the Tower Captains and churches for making us so welcome.